This problem forced the Pentecostals to either state they were in theological error or redefine speaking in tongues. They chose the latter and modified the definition found in modern commentaries and theologians; mainly those of Philip Schaff, the renowned Anglican writer and speaker Frederick Farrar, the Anglican authors Conybeare and Howson, and a small number of other writers who belonged to the same interpretative framework called Higher Criticism. Many readers are skeptical of such an assertion. The submission of evidence in the previous portions of this series of articles is weak in connecting the Pentecostal tongues doctrine with that of Higher Criticism. This article will remedy this circumstance with important, substantiated details. 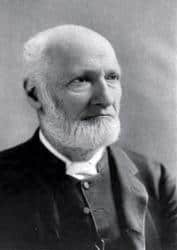 Philip Schaff (January 1, 1819 – October 20, 1893) was the number one source that the early Pentecostals used to trace their tongues-speaking history. This has already been demonstrated in part 3 of this series where Pentecostals built a historical framework for tongues largely through Schaff’s historical framework. Here are a few more additions to his already revealed relationship. It is hard to go wrong with such a respected and venerated academic. He is one of the first American-based religious scholars to gain such universal admiration and a literary powerhouse. He produced and oversaw a vast library of publications relating to church history. The level of detail reflecting the history of Christendom is unrivaled even by today’s standards. The attempt by Pentecostals to align his scholarly history with their own experience would be more than enough to establish their newfound identity and acceptance into the religious echelons. They partially succeeded by doing so. Schaff was a Swiss-born, German-educated professor who studied at three of the most prestigious schools of theology; the universities of Tübingen, then Halle, and finally Berlin. He studied under the greatest German names of theology and philosophy ever produced, especially that of August Neander who is considered the father of the modern glossolalia movement. This historian moved to the United States in 1843 and became a professor of Church history and Biblical Literature at the German Reformed Theological Seminary of Mercersburg, Pennsylvania.2 He later taught at the Union Theological Seminary, New York City, and served there until his death. 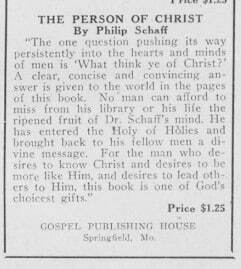 The Assemblies of God publishing arm, Gospel Publishing House, thought so highly of Schaff that they produced a tract from his works and put it up for sale through their flagship newspaper. Frederick William Farrar was a gifted Anglican philologist, historian, writer, and speaker. His talents were recognized by Queen Victoria who made him her honorary chaplain.6 He was later called Dean Farrar to reflect his later position as the Dean of Canterbury. His many publications, especially The Life of Christ, was highly successful both in England and the United States. He was a friend of Charles Darwin and a pallbearer at his funeral. Pentecostals embraced two of his writings and oddly ignored one other important one. 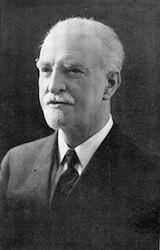 Farrar rose to prominence in the Pentecostal community when A. 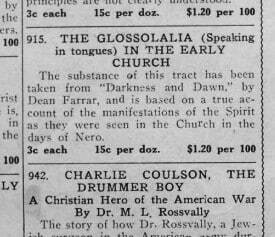 A. Boddy published in the May, 1914 edition of Confidence an article called “Glossolalia in the Early Church.”7 which is a book review of Darkness to Dawn by Farrar. As the policy of early Pentecostal periodicals, the name of the actual reviewer is not cited by the publisher. The reviewer had high respect for the intellectual and historical genius of this high ranking Anglican leader. Although the book was a well-received story about fictional characters in early Rome, the historical framework was considered historically accurate – especially concerning the mode of worship and the rite of speaking in tongues. The tract advertisement promoted that the book was a true account. It became a critical reading for all Pentecostals who wanted to know the historical background of speaking in tongues. It was advertised and promoted in every edition of the Christian Evangel for many years. Farrar’s important theological work, The Life of St. Paul is omitted from any promotion within the Pentecostal realm. This book had historical significance because it was one of the gateways of German religious thought into the English religious vocabulary. Oxford Encyclopedia co-credited Farrar as the creator of the English word glossolalia. Farrar promoted that the tongues of Pentecost had nothing to do with a foreign language. “Pentecost, does not contain the remotest hint of foreign languages. Hence the fancy that this was the immediate result of Pentecost is unknown to the first two centuries, and only sprang up when the true tradition obscured.”13 This comment was almost verbatim from the great German scholar that he so greatly admired, August Neander. The new concept of tongues as a divine language was also found in Britain where a Pentecostal newspaper, Confidence was published. This paper began in 1908 under the editorship of A. A. Boddy, an Anglican vicar at All Saints in Monkwearmouth, Sunderland, England. Confidence gave a slightly more critical and intellectual nuance to the movement at a critical juncture in the movement’s infancy. Boddy and the majority of Pentecostals do not interpret Conybeare and Howson as Higher Criticism scholars. Instead, they saw two respected academics from an established and respected institution whose views align closely with their experience. The Assemblies of God newspaper which briefly had the name, Weekly Evangel wrote a detailed piece in 1916 called “ Article VII. — The Gift of Tongues, and the Pentecostal Movement.” A writer named B. F. Lawrence concluded the miraculous endowment of tongues as a missionary aid was unfounded. He cited Schaff, Conybeare and Howson as his authority. Speaking in foreign languages can occur, but this is not the main purpose. The intent is to magnify God in whatever way that happens.16. This Encyclopedia was cited only on a few rare occasions, and the only one marked for this research was in the Church of God Evangel in 1933.17 This dictionary had little influence. Frank Bartleman called upon a theologian named James Stalker (1902-1924ish) to support his experience.18 Stalker was a Free Church of Scotland minister and was widely known in the United States where he frequently spoke at seminaries and churches. Stalker didn’t think that the gift of tongues was a rite of speaking a foreign language – it was a tranced utterance and impassioned rhapsody.19 Here is yet another author borrowing from the Higher Criticism cupboard. This author fit in with Bartleman’s belief that the inspiration could express itself in musical forms. The Pulpit Commentary was a massive 23 volume work that approached Biblical exposition from many angles. Volumes began appearing in the later 1800s and took over thirty years to complete. There were over 100 contributors to different sections of the Bible who were from clergyman to dissenting ministers.20 The editors were two Anglican-based clerics; Rev. H. D. M. Spence and Rev. Joseph S. Exell. The Assemblies of God magazine published on two occasions using the Pulpit Commentary as an explanation for speaking in tongues. The first one was in 1916 by John S. Mercer, and the second time in 1927 by Ernest S. Williams. Ernest S. Williams was a general superintendent of the Assemblies of God and also an original participant at the Azusa Street revival. The two sections of the Pulpit Commentary cited by Mercer are the Book of Acts by Lord Bishop of Bath and Wells, Rev. Lord A. C. Hervey, and I Corinthians by F. W. Farrar. The Pulpit Commentary on I Corinthians was written by none other than F. W. Farrar himself. 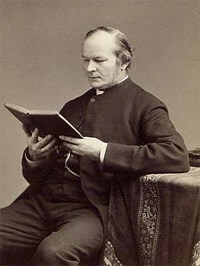 T. B. Barratt, a powerful Norwegian preacher and associate of Boddy, was partially responsible for the expansion of Pentecostalism in Europe. He recognized the encroachment of Higher Criticism within the ranks and fought against it. In 1909, Barratt produced the book, In the Last Days of the Latter Rain which may be the most comprehensive coverage on speaking in tongues from a Pentecostal standpoint. In this book, he ardently struggled against Higher Criticism and tried to maintain a traditional progressive stance. The book is a reactionary one based on an article he read on tongues that he disagreed with. Unfortunately, he failed to identify the author, but the citations and structure closely parallel the works of Frederick Farrar. Barratt denounced the Higher Criticism idea that the Pentecost “does not contain the remotest hint of foreign languages,”30 and the real Pentecost was obscure, so a later tradition two-centuries made it out as a miracle of speech. The anonymous writer added that Greek was an international language that the known world shared, and it was unnecessary to speak in foreign languages for the expansion of the Gospel. He also refuted the idea that the tongues of Corinth were sounds instead of languages,31 and disagreed with Frederick Farrar’s assessment of tongues not being a foreign language. The oration shows a shift in the Pentecostal doctrine of tongues and movement towards the words ecstasy and utterance. He once again entertains the idea that it is possible that sometimes it can be a non-human or heavenly language, but emphasizes the miracle of a foreign language by a wide margin. He defends against the idea that Pentecost was a miracle of language and Corinth ecstatic utterances. “The Bible represents the same kind of tongues in both Jerusalem and Corinth. If they spoke in ecstatic exclamations in Corinth, then they did so in Jerusalem also. Possibly they spoke both in language and in ecstasy in both places.”33 He was aware of Neander’s redefining of tongues as an ecstatic rhapsody and rejected it. He had a strong emphasis in the book on the miracle of speaking in foreign languages. However, he does waffle on the subject. He declares that he has seen both. “We have personal experience of both of these forms of speaking in tongues, and have heard them extensively used by the Spirit at our meetings”. He believed that when a person spoke, they did not know what they were speaking. It was an undefined sound. Barratt recognized the conflict in theories, but he fails to resolve this tension. T. B. Barratt and the Confidence newspaper follow a similar pattern to that of the Apostolic Faith newspaper after 1910. This date was where the activity of speaking in tongues begun to have less coverage. Some references still occurred like the one in a 1913 issue. A woman wrote about speaking in tongues and expressed: “One is lost in God, swept up to heavenly places, and gives utterance in strange sounds, in an unknown tongue, which flow over our lips, now as shouts of joy, then as fervent utterances of love towards our Redeemer, Jesus Christ, and then as petitions.”34 Her experience shows a change in attitude in tongues from a missionary to a personal and private one. Unfortunately, Barratt’s attempt to reconcile the traditional interpretation with modern practice and his proper critique of historical criticism never took hold in the larger collective mind of the Pentecostal hive. Both Barratt and Boddy became sidelined from the American corpus. The opening of World War I caused many countries to form isolationist thinking and actions limited both Boddy and Barratt in the American affairs of Pentecostalism at a critical juncture of its emerging structure. 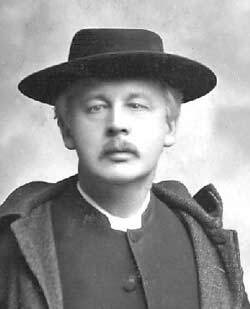 Barratt was also mired in theological problems inside his Norwegian church and community that were unique to his situation. One must be cognizant of the fact that he was writing in the language of religious scholarship. This would offput the majority of the collective Pentecostal mind who were reactive against such an approach. Neither did Boddy nor Barratt fully endorse the baptism with the Holy Spirit with the initial evidence of speaking in tongues. This too would have been a factor. In respect to speaking in tongues being foreign languages, he was in the same boat as the editors of the Apostolic Faith Newspaper, Clara Lum and Florence Crawford. They were old guards in an evolving and changing movement. This completes the four-part series on why the traditional tongues of Pentecost was relegated mostly to the sidelines and replaced by their adaptation of the glossolalia doctrine espoused by Higher Criticism. The new definitions arose because of the failure of missionary tongues and the media’s backlash of them speaking gibberish. Instead of admitting that their announcement of the miraculous return of speaking in tongues was a mistake, they chose to find a different meaning that explained what was really happening in their midst. 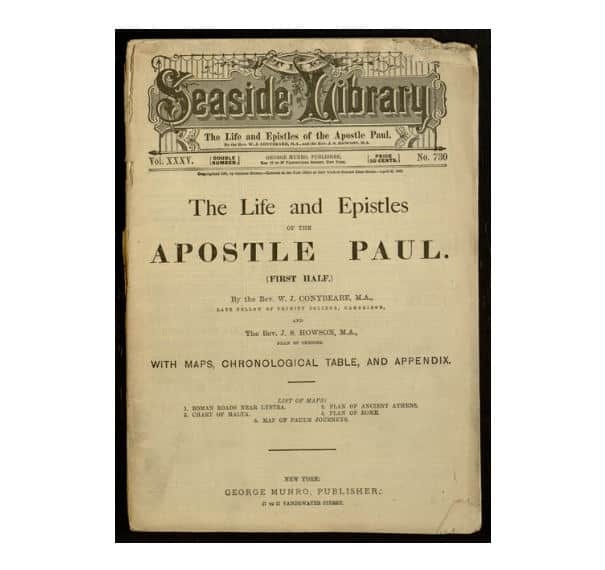 This series clearly shows that Pentecostals looked at specific histories that lined up with their own experience, especially that of Schaff, Farrar, a lesser input from Conybeare and Howson, and a few others. Philip Schaff and F. W. Farrar were so heavily relied upon that it would be fair to say that Pentecostals are followers of these authors tongues framework. The shift began happening already in 1907 and continued an evolution whereby by 1947 Pentecostals believed solely in tongues as a private means of expression and that missionary tongues was a sad mistake that had been corrected. This narrative demonstrates how early Pentecostals lacked the fundamental tools of hermeneutics to study the doctrine themselves and the longstanding effects of it. They had to leave it to third-party specialists who were capable of reading, interpreting and translating Greek, Latin, and other texts and weaving a historical narrative. They had no sense that the external authors they depended on were solely from a Higher Criticism framework – who often didn’t even include the traditional interpretation. Even today, Pentecostal scholars have yet to make this connection or reevaluate this doctrine using a critical apparatus. Charles Sullivan has been involved with the charismatic movement since the 1980s and presently attends a charismatic church in Winnipeg called The Church of the Rock. “The Baptism with the Holy Ghost and the Evidence” as found in The Church of God Evangel. Nov. 18, 1933. Vol. 24. No. 37. Bartleman’s quotation of Stalker is not literal. He has edited the copy from Stalker’s original, though it doesn’t hurt his cause. See The original Life of St. Paul on Pg. 102 and compare it Bartleman’s. Pentecostal Evangel. July 23, 1927. No. 707. Pg. 2. See the Pulpit Commentary Page 456 for more information. Pentecostal Evangel. July 23, 1927. No. 707. Pg. 2. See the Pulpit Commentary Page 457 for more information. T. B. Barrett. In the Last Days of the Latter Rain. London: Elim Publishing Company, Ltd. 1928. Pgs. 80-91; He is quoting from Farrar’s “Life and Work of St. Paul. London: Cassel and Company. 1897. Pg. 53.